This is a centralised AD facility. The plant is designed to achieve several goals- nutrient management for local farmers, waste management for local industries, local employment, low cost heating for the town and renewable electricity production for the grid. 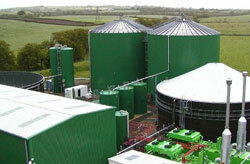 Originally a community project, Summerleaze took over in March 2005 and has invested in upgrades, including an additional storage tank, new offices, improvements to the gas system and new odour control. Planned improvements include new gas and digestate storage facilities, delivery handling facilities, upgrades to existing storage tanks, a steam injection heating system and improvements to on site monitoring facilities. 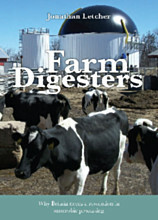 Include cattle slurry, abattoir waste and food processing waste. The operators are also experimenting with energy crops such as maize. Processing capacity is up to 140,000 tonnes/ year. The plant currently takes around 80,000 tonnes/ year. Required energy input: 200kW electrical, 1MW heat. Installed electrical capacity: 2.1MW, with current average of 1.2MW. Heat: 1.5MW Digestate will be offered to local farms. With the upgrades complete, 2.5 MW power and 3MW heat are planned.